'The Flow' descends down from the source through the dimensions inside you. It speaks first through higher mind, landing as a spontaneous knowing - "this is the way to go now". Or else you'll have visions of future-landing-now, and get knowings of the educational purpose for how the moment is configuring. The moment is always there to teach you something about yourself and those around you (for this all to be functioning correctly, higher mind needs to be activated). So far so good. However, as the flow descends through the dimensions, souls are drawn together for a mutual learning experience which invokes and involves collective karma. Karma draws the threads of the quantum soup together, so as to create a reality which souls can engage in, in order to confront and process this karma. This is where the complexity happens. The consensus reality ('consensus' at a soul level, which is frequently unconscious) creates a reality with form, encompassing judgments, which are intrinsic to the karma. Like for example, you may consume animals without consideration. Or likewise exploit the resources of mother earth without feeling the need to be compassionate for her. Or else people configure the environment to suit purely human needs. Such unconscious judgments arise from collective karma, and create a reality with all manner of rules, regulations and 'normal acceptability' (but often without conscious accountability). Consider for example how 'alternative medicine' is being marginalised by the system because of the judgments society makes. Consider how the powers-that-be manipulate the climate or encourage genetic modification of prime foods, without labeling, and with stark consideration for the wider impact on the environment. All of these judgments, and countless more, shape first in the 4D field, which contains the karmic footprint humanity is working within. And this karmic footprint has a flow all of it's own. It's a harmonising flow that works to 'connect the dots' so to speak - to connect up the fragments of light wanting to emerge from this density. The light progressively emerges and reality realigns with the source, the higher flow, inviting all those within it, to join the movement. In each of the judgments, the soul is accepting a compromise, in order to build the reality and have the experience - albeit a distorted experience. What doses this mean in a practical sense? It means that in any engagement - within families for example or with your work colleagues - each will be being influenced by two varying flows, depending on their degree of awakeness. If they're pretty asleep, they'll be reacting mainly to the lower flow, which has created this reality. If they're fairly awake, then they'll be receiving higher flow impulses to change the reality. The higher flow is constantly seeping into the lower one, and working to connect up with it, so as to transform it into a higher vibration - it's fuelling the current transition from 3D to 5D reality. It means you'll have to bridge between world's in just about everything that you do. Which is going to frequently feel like you're being pulled in two different and contrasting directions within the choices you make. It's going to feel very destabilising within, for quite some time, until this phenomenon is integrated. How do you integrate this destabilising experience? You have to stand in the middle of the two realities - as the bridge between them. You have to keep feeling for the higher truth, but then expressing it in an as accessible way as possible. You're not compromising the higher truth that you feel (and observe being backed up by synchronicity), but you can always soften the way you express it - to make it less harsh for example, more understanding and bridging. So in disagreements, it's always good to build bridges by first honouring the other's truth, no matter how distorted. Work to build a bridge by empathising with at least some aspect of what they're saying - even and especially when they're young and not yet emotionally mature. Begin by supporting and upholding their truth. I've found it's then much more likely they'll embrace aspects of your point of view. I call it building bridges. You will likely feel pulled in two different and contrasting directions. It's often like two different worlds exist in different parts of your brain. Don't worry! You're not going crazy. If you let go of the need for any kind of outcome in these situations and just keep aligning with the rightness of truth that you can feel, then you'll become adept at dancing between the world's and blending the two different flows. It also pays to be discerning with the truth that you express - when, where and how. Not everyone - in fact most - are not going to be in a place where they can understand the higher reality and flows that you're plugging into. Although the soul will yearn to be transparent (clarity and truthfulness are key qualities of the soul), nevertheless, it won't necessarily pay to blurt out the entire workings of the cosmos when it's homework time or your teenager is just off to the local rave! So you've got to learn how to dance between the realities. Recognise the higher flow is always an educational opportunity - for integration of soul. This will embrace all those around you, even if they don't yet get it. You may even see the lessons they're supposed to get, but aren't yet ready to. Play your part, but be as gentle as possible - don't use a sledge hammer to crack the outer layer! In the lower flow, it will get more turgid - more regimented, according to the consensus karmic reality created. People will fall over, have challenging times and come a cropper in this reality. Nevertheless, we all only ever manifest the reflections we need, no matter how challenging. So bless these distorted manifestations - these 'accidents' on the path - for they are excellent mirrors. And as people learn through them, more and more of the flow feeds in and connects up. And as it does, then the lower reality begins to shift more strongly and transform. In fact your very consciousness is acting as a channel to feed in transforming flow. Did I say it was easy? It is not. But know that you're not alone. You're never alone. Higher consciousness is all around you, supporting you. It won't always tell you exactly what to do however, because this is all about self-empowerment - self-realisation. But it will give plenty of reflections and clues on the way. Take heart, there are literally thousands of unsung heroes like you out there in the field, here to channel in the light. You may at times feel like you're alone and perhaps going a bit crazy. You're not! Stand firm, test you truth, be prepared to adapt and evolve. But nevertheless build trust in your truth. Trust in the bridge that you're becoming, even if many around you haven't got a clue what you're doing! Here you are, blending the higher flow into the lower one. A herculean task! I see you. We often hear in Spiritual Circles about "the importance of speaking one's truth". Yet so often, I hear from people that when they do this, such as in family groups for example, others frequently resist; they still work to pigeon-hole you into the 'norm' - they still try to stick you in that labeled box that they're comfortable with. Short of completely walking away from the relationship, what choice are you left with? Personally I believe "speaking one's truth" is a misnomer and we would better be served by speaking more in terms of "expressing one's truth". What's the subtle difference and why's it so important? I recall leaving a marriage which simply wasn't working. I'd gone through a massive spiritual expansion, and despite months of marriage guidance counseling, working to find common ground, my partner couldn't accept who I now was. She'd frequently project judgment at me and try to contain me in the old comfortable 'slippers'. Even after our marriage ended, I'd still experience massive projection on daily visits to see our kids. Like many on the spiritual path, there was a strong compulsion to "speak my truth". Yes, I had changed; yes, that had affected the marriage, but it's vitally important that a person honours who they are at a soul level. Otherwise your True Self can't fully expand and grow. Parents found it extremely challenging too. They'd known me a certain way. All of their conditioning desperately wanted to keep me in the old identity, suffocating me down into the old way of being. No matter how I tried to share, nothing seemed to work. I'd end up in repetitive conversations or arguments that would go nowhere. Worse still, I found myself inwardly constrained by the old identity. But then something changed...I watched the Matrix! There's a great scene at the end of the first film where Neo puts up his hand to incoming bullets and says "No!" Most importantly though, energetically, he expresses "No!" It caused me to remember a deeper aspect of my Cosmic Self: he was expressing what I know to be the "Spiritual Samurai". And most importantly, how you can influence the field - shift 3D reality - from that place. If you continue to engage in a relationship that simply won't acknowledge who you are and who you feel to be, if you keep trying to explain yourself, then in effect you are defending yourself. And by defending yourself, inadvertently you're honouring the attack - you're actually making it real by continuing to engage in those disempowering loops of behaviour that are resistant to change. It is these loops, that when activated, perpetuate the old existence, the old reality. I remember receiving a barrage of judgment from a work colleague the day after watching the film. Something stopped me from responding verbally - a vision of Neo standing there caught me. Instead, internally, I put up an energetic hand... "No! I will not receive your judgement." I didn't feel aggressive. I wasn't about to go on the attack. I simply made a bold statement within my field. This feeling radiated through me, and out into the surrounding field; whereupon, realising he was making no headway, that his attack was having no effect, my colleague simply stopped. What had changed was that no one was feeding his controlling behavioural loop. So it had nowhere to go. There was nothing bolstering it, and so it petered out. "Become as nothing in the face of your enemies and they have nowhere to strike." So this time, I saw the 'bullets' coming in, but instead, let them pass straight through. Something truly amazing happened. I recognised I'd been tight in the abdomen - unconscious in it. Now I could feel myself unwinding there, which felt blissful. With each attack, I felt increasingly blissed out, until my belly started to rumble and then chuckle. In the face of the attack, I was soon laughing. Pretty much immediately the attack ceased - the person was able to see how ludicrous they had become (it's an example of Breakthrough - a powerful way to unleash your Cosmic Self, which I've written about in this book...Breakthrough: divine revelations). I imagine to some this might seem like it's lacking compassion. However, there was absolutely no negative intention in my response (in fact there was no intention at all), it simply arose directly, spontaneously and authentically from my soul. Of course true compassion has nothing to do with supporting emotionally distorted behaviour, but rather in some way, "calling the truth" on it. Because it is only the truth that can truly set someone free (and I'm not advocating that you necessarily take this particular approach if attacked, ie laughing in the face of it. You must seek the authentic response, whatever that might be). In this case, the unexpected response created a powerful mirror that caused the attacker to turn in on themselves and question their own behaviour. The attack unwound itself and in the bargain, offered the potential for the attacker to self-realise something of great value. This is what I call the Spiritual Samurai. In short the Spiritual Samurai does not speak about her actions, she simply acts. The action must come from the soul. It arises only as a last resort when there's no diplomatic way forwards. She does not fight or attack. He changes the 'goal posts' of an old reality by changing the situation decisively. She can speak a thousand words in pure silence. He does not have to defend himself. She does not need others to accept her truth. He doesn't need his truth to be seen or heard. She does not need others to respect or honour her; she respects herself. He can clearly and directly walk away...and not come back. She can decide NOT to answer that phone, text or email. He doesn't need to win over the mainstream of opinion. She just is. Maybe my writing touches the Spiritual Samurai in you? Maybe you can find the power to act differently next time you feel overwhelmingly judged? Remember, there is absolutely no attack with this energy - all attack comes from a place of weakness. It's simply about the requirement for self-determination and if the situation provides you no other freedom of choice, in terms of physical acceptability, you simply take the route of greatest inner empowerment. This is the Spiritual Samurai. Your article helps to illuminate what I'm experiencing. I'm gradually refining the when, where, and how to express one's truth while honouring another's. Lots of hits and misses as I go. Indeed, a hurculean task to dance between the realities and bridge the higher and lower flows. I'm feeling overwhelmed with this right now. But I'm not out for the count. Love and compassion are helping me find the way. I take heart from your article. Thank you. Dear Open, absolute synchronicity on your words for me, my heartfelt thanks. Turbid is precisely my journey at the moment, and I have experienced this for some time now, at very intense levels, for me. As I read the words, the truth of them welled up in me as though they were my own thoughts. I thoroughly resonate, and very gratefully so. As a prime example for me - over the last few years we've been doing lots of building,repair and decorating work and every time it comes to make a decision about what product to buy or how to proceed I find/found myself right in the middle of these two flows - on the one hand an authentic higher pull to a particular creation, and leading into the pull to use the most environmentally sound and natursl products possible in that, then meeting the practical side - well some building products just aren't sustainable/environmentally sound, others are shipped around the world etc - sometimes there are no 'natural', or even recylced alternatives, although i spent many many hours scouring the shops and online to realise that. It was incredibly frustrating. I did learn after many times that compromise in a practical way was not only okay but necessary in order to move forward. There's lots of examples of course! I think often decisions are difficult because most things 'here' are a 'compromise', a meeting of the two pulls. I had already come to a greater place of surrender in the compromise of expression here. You writing about the two flows really helps me understand and integrate that more fully. Thankyou. It so amazing how you not only have the depth of insight but are able to put it into easily understandable words. Thanks for the support guys - glad it resonates. And yes Ben, I so frequently encounter the same dynamic in the world of 'do-it-yourself' - a constant compromise, or else you just don't get anything done. I read this article while seated in a cafe in the midst of a tornado warning...a poignant mirror to what feels like to me increasing winds of change. In my personal world, things are coming up that challenge me to surrender more deeply to the flow...as I am potentially asked to rejoin the workforce, I feel all manner of things being stirred up - that need to be so...abandonment, betrayal - all of which is already in here and being triggered by possibilities - an exploration within the other of what is real for him, what really makes his heart sing...that's awesome on many levels but it's stirring up stuff I didn't know I still had in here! =). As the mind started to panic about the lack of "hard" skills after being home with the children for the last 12 years...I started to see signs "the key" "stay connected" - "hardware imagination" "Midway services"....attuning to this higher flow...the reality I have become accustomed to appears to be breaking down on some level - inviting me to confront these aspects that are attached to the lower flow. A sense of peace descended upon me as I read the words Creating Beautiful....in the seeming mess, in the breakdown is the alignment with the flow of love, beauty and truth. Bring it on! Wow Jen - I feel that. It's wonderful that you can hold a steady vibe as you transition. What's more you'll come out stronger and more evolved with it. Today I've been sitting all day alone, with myself, meditating, observing, contemplating, thinking of my younger years, why I did certain choices in my life, why I emigrated 11 years ago to the Netherlands (a water country which to me says a lot, don't want to go into details right now). Since a while ago I've been yearning so much for finding my true passion and literally live from it and then I came to the conclusion that I am good where I am now and somehow I felt that my job was to link/connect people and then I've bumped into your article above which literally has spoken to my heart. I am working for an international company and I somehow sort of like what I do (business support for Southern European customers) but I am not 100% convinced I should be still doing this for a very long time. I now quite certainly know I am only there to just be, nothing more, but I've also noticed that I can very well connect with people at many levels, yet tending to support those ones who are less fortunate, who have less confidence or can't integrate or are seen as outsiders. I guess the idea of building bridges has given me a better insight on what my purpose more or less is. One of the things you'll come to see in the work here, is being less concerned with the doing aspect of life. Not that we don't do things, of course we all do. It's that we recognise that authentic beingness initiates all authentic action. Figure out how you're being invited to be, and when you express that, you put energy out into the world which then shapes your environment most positively. So it would seem like you've hit on the aspect you're most being invited to look at now - that of being a kind of diplomatic bridge. 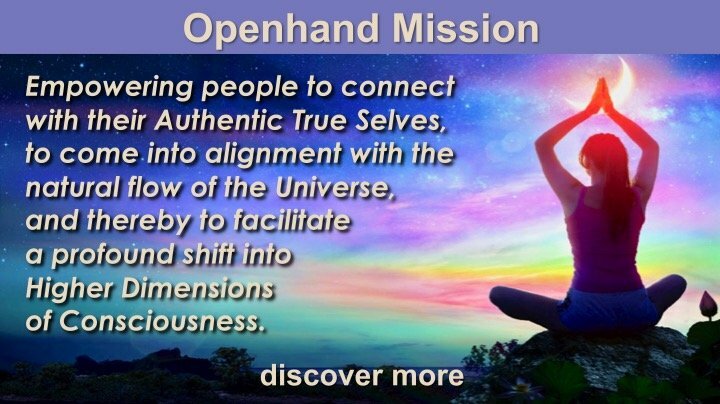 Which at Openhand we refer to as the 'ray 4 aspect of the soul' (check this out when you have the time...Bridge between Worlds). As you master this quality, surely the world will shape in exciting new ways for you. Thankyou for this Article Open, It speaks volumes to me, I am studying for a degree in social work, and returning after been on summer break has been challenging. I often wonder why I feel so strongly to do it as I know that I struggle with the corporate culture that is so easy to get bogged down in once I am finished and get to work in the field. We had a wonderful guest lecturer yesterday who inspired me to carry on, I could see this is how she worked, by being a bridge, and to read this today before I attend school for the day leaves me a feeling of rightness and hope. I've always feel ill at ease with the apparent paradoxes of our existence. Is this the difference in the 3D and 5D flows? I think at the mind level am ok with confusion and not knowing. But it seems to be within my being in general. Deeply enjoyed re-reading this article, thank you. It feels so poignant with the amount of lower density being churned up right now. So much opportunity, calling. Thank you for this article, its helped me to understand a bit more the things I've seen and experienced lately. Hi Wyndè, you're most welcome. It's definitely a challenge in life blending higher and lower flows in a society that's become so disconnected. But the balance is shifting now to the higher consciousness, more souls are being liberated from the old karmic reality, and so we're going to increasingly find support through the ether for our higher truth choices and manifestations. wow perfectly describes life - I didn't think of it in this way at all before reading this article. I couldn't understand why I was "swithering" so much. Thought I may be going a bit crazy at one point. Brilliant - thankyou! I read this as I was mulling over my relationship with my mother and brother . They are very much in the throes of 3D frequencies and try to undermine and deny every bit of the higher vibe I attempt to get into their home and their lives . So dominated are they with controlling their life in a very fear based way ,all I can do many times is to stay away from their density which makes me feel like a traitor .